On the frontier of the Nayen empire, the last few human kingdoms cling to independence, and the Onei hide in their wastelands. The Nayen armies, a military force supplemented with creatures summoned from a list of hells, batter the human defenders while the newly built Nayen monasteries sacrifice conquered souls to the infernal realms to pacify their subjects. Caldane, a young Onei shaman enslaved when his clan was destroyed, a survivor of several sacrifices, yearns to return to his homeland to find a new clan, until he learns his mother’s fate. Aissal, an idealistic blue-skinned coulven lass who chose to come to this world to fight the evil spreading through the realms, finds herself captured and alone in a world she does not understand. Rucker, a young southlander boy from Timyiskil, wants to go back to his family at the brewery and have things go back to the way they used to be. Overseer Fi Cheen, a Nayen monk with his career path on his mind, tracks the escaped slaves across the southlander kingdoms to Windhaven. General Esmela Silverhewer, a Giantess from the realm of Stone, revels in her charge of conquering the human kingdoms and killing every last Onei on the planet, a commission straight from the Empress herself. But when Caldane escapes, he takes more than a few useless slaves with him; he takes the Archbishop’s Amulet, a powerful magical item central to the Nayen spells used to remove the hopes and dreams of the subjugated populace. Dark Fantasy has been a long time favorite genre of mine to read. I actually started reading this genre around 2000. I had picked up Daughter of The Blood by Anne Bishop at Barnes and Nobles, thinking it was regular fantasy and ended up getting hooked. While I have expanded my view, greatly, on reading different genres, dark fantasy is and always will be one of my favorites to read. 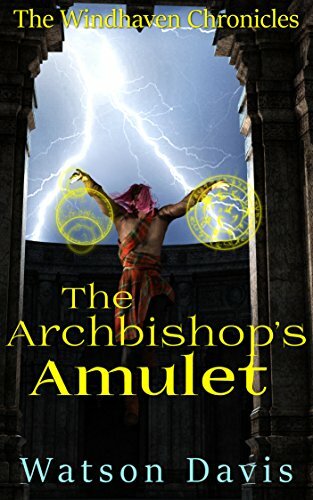 The Archbishop’s Amulet is another great book written by Watson Davis. Told several generations after The Devil’s Library but before Not Dead Enough, it brings you full force into the Nayen Empire and their desire to wipe out all who oppose the Empress. It also tells a tale of a people who will fight the Empress and the Empire to their last breath. I really enjoyed, as I did in the last couple of books, how the author intermingled Asian and Norse mythology. Like in The Devil’s Library, it made for a very interesting book to read. Just the differences in the religions alone were fascinating to read. Caldane was such a strong young man. To survive what he survived, no wonder he didn’t want to make friends or feel anything for anyone. He was just trying to survive in a world where he could die any minute and if he didn’t, any friends would die. So, I was a little surprised when he decided to take Rucker along with him and when he went back to get him after almost being free. Which resulted in him getting caught again and resulted in another sacrifice. I didn’t understand the purpose of the sacrifices until that scene and I was sickened by it. But when it went horribly wrong and Caldane, Aissal, Rucker, and Cole were freed, I cheered. I cheered, even more, when Caldane took the amulet off of the Archbishop. The only reason I cheered was that I knew that amulet would play a huge role in the book. And I was right but you need to read the book to find out. I did get annoyed by Aissal, Rucker, and Cole. Cole was beyond aggressive, Rucker was just annoying and Aissal was too optimistic. Even after everything that happened, two of them still got into shenanigans and wouldn’t listen to Caldane. Which made me want to rip my hair out of my head and smack a couple of kids upside the head. But then I got to thinking about it and they were acting like typical tween/teenagers…even though they were on the run and their behavior made sense. The other storyline with Fi Cheen and General Silverhewer was very interesting. Very interesting because General Silverhewer was bribing Fi Cheen to get more money and Fi Cheen was going along with it because he wanted the slaves and the amulet back. Also added into the mix was that General Silverhewer had an ace up her sleeve when it came to the kids and she wasn’t afraid to use it. The storylines were wrapped up perfectly at the end of the book, leaving Caldane’s open. I really hope that the author is planning on writing another book in this world because I loved it. He did such great world building and adding that the worlds are multidimensional, yeah, I need to read another one. I am actually hoping that Aissal’s people get a book because I would love to know more about them. Blue-skinned, white-haired witches from another dimension….sign me up!! Why: Again, another great book by Watson Davis. It has a great plot, characters that grow on you and enough action that I will be satisfied for a few weeks. Plus, don’t forget that it’s a fantasy, so there is magic all around! !